Since the birth of Pakistan, the state is struggling for democracy and facing serious challenges both political and military. This has been a country of fledgling democracy and currently been a subject to street challenge and soft coup by its powerful army. The recent crisis in Pakistan has been started with thousands of protesters led by opposition politician Imran Khan and a populist cleric Tahir-ul-Qadri have camped out in Islamabad since August 15 demanding Prime Minister Nawaz Sharif step down. Sharif made extravagant promises during the 2013 electoral campaign that have yet to be fulfilled. For example, the delivery of basic services remains dismal across the board — in particular, the severe energy shortage shows no sign of resolution. Another problem is that political power is excessively centralized. Sharif and his closest associates call the shots on all major initiatives, which has reduced the pool of available technocratic expertise and made the regime vulnerable to the charge of crony governance. Sharif himself has been disengaged from parliament, appearing a mere seven times in the national assembly over the course of the first parliamentary year. And much needed economic reforms that could result in job creation and significant economic growth. Sharif’s political opposition now seeks to capitalize on public discontent by exerting pressure on the government through the mobilization of street power. The cricketer-turned politician Imran Khan alleges the 2013 general election that swept Sharif to power in a landslide was rigged. His party Pakistan Tehreek-i-Insaf (PTI) accuses Mr. Sharif’s party Pakistan Muslim League (PML-N) of fixing the vote in a number of constituencies. Although international observers noted some irregularities, the election was accepted as broadly free and fair. The Pakistan Awamy Tehreek (PAT) leader Qadri has demanded wholesale changes to Pakistan’s political system and called for an interim ‘unity government’ while they are implemented. Mr. Qadri’s campaign has been energized by anger among his supporters and the broader public over a police shooting episode in Lahore, June in which at least 10 of his supporters were killed. Mr. Qadri has accused Shahbaz Sharif, who has direct control over the Lahore police, of ordering the shootings. However, Imran and Qadri have drawn thousands to the streets in Islamabad, though support has dwindled over the last week and their call has not mobilised a mass movement in the country of 180 million people. Every night, the two protest leaders have held rallies in Islamabad, defying predictions from government supporters that their movements would fade away. But the prime minister refuses to accept what he has criticized as an unconstitutional demand and his attempts to seek a negotiated settlement of the political turmoil have not succeeded. 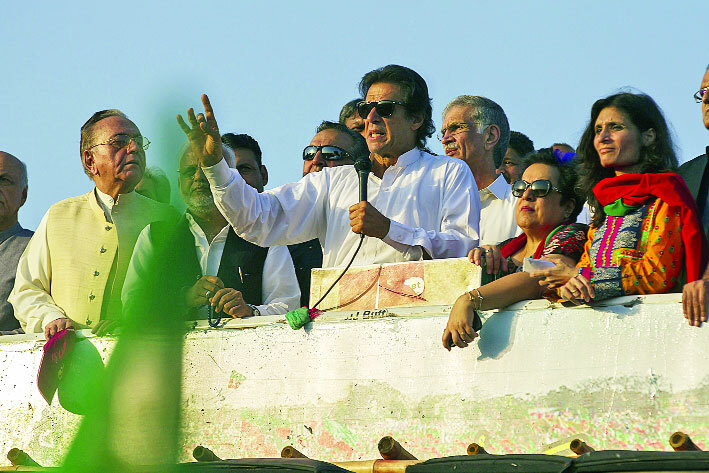 Imran has called for a tax boycott, threatened to have his supporters storm the prime minister’s house, and pulled his party’s lawmakers from Parliament. In interviews, he has compared himself to Gandhi and to Tariq ibn Ziyad, an eighth-century Islamic general. In speeches, he has threatened his enemies and taunted Mr. Sharif, at one point challenging him to a fistfight. This standoff has weakened Sharif, and led a number of observers to say the powerful military would use the crisis to reclaim a hold over its traditional spheres of influence in Pakistani politics- defence and foreign policy. Given Pakistan’s political history, the final arbiter of this conflict will be the army as well. Backdoor consultations have continued as close associates of the PM have been meeting the army chief. Sharif has also consulted the army chief sensing that he may possess the key to final resolution. A few days ago, a Reuters report said that matters between the Army and Mr. Sharif were getting resolved by the latter agreeing to ‘share’ space with the army. This space sharing is understood as the involvement of military in politics, which can be regarded as ‘soft coup’. It has helped the military in its long-running battle for supremacy over the civilian government. The army urges politicians to resolve their differences with ‘patience, wisdom and sagacity.’ Though benignly worded, the statement caused anxious flutters among the political class, who note Pakistan’s long history of military coups. Few days later, the Prime Minister Sharif has requested to the army chief for discussing with PTI and PAT in order to help resolving the crisis. Sharif has come under severe criticism from pro-democracy forces in the country, largely for turning to the army in his bid to resolve what analysts see as a crisis that needs political means to settle. Even the parliamentary allies and the rest of opposition political parties are not involved in the mass protests sought an explanation for what they condemned as an anti-democracy move. The military’s political intervention underscored the weakness of Pakistan’s democracy just 16 months after the country’s first democratic transition. As the Pakistani military has a long history of either manipulating politicians from behind the scenes or directly seizing power in coups. Pakistan’s latest period of military rule, over eight years under General Pervez Musharraf, ended in 2008, with the elections that brought the PPP to power. Mr Musharraf had planned to stay on as president, which is supposedly a ceremonial position, but he was eased out after that election by Mr Zardari, who replaced him. Mr. Sharif came to power hoping to show a strong civilian hand. But he has squabbled with the generals over policy toward India, peace talks with the Taliban and the fate of the former military ruler Pervez Musharraf, who faces treason charges. There is speculation that the military will use the current crisis to get Sharif to let Musharraf, who deposed him in a coup in 1999- leave the country. The Pakistan Army is the best organized group in the country, and a political force unto itself with the gradual destruction or diminution of institutions: the judiciary, the constitution, the bureaucracy, and the legislature, and the transmogrification of a parliamentary system of government into a highly personalized presidential system. The army is also engaged in extensive economic activities. The Military in Pakistan has ruled directly for more than half of the country’s 67 years of chequered history. Military coups in Pakistan began in 1958 and number three successful attempts. There have also been numerous unsuccessful attempts since 1949. Since its independence in 1947, Pakistan has spent several decades under military rule (1958-1971, 1977-1988, and 1999-2008). Democracy as a system of governance and interest representation demands respect for dissent and opposition. It recognises the principle of majority rule and guarantees protection of minorities. Democracy also builds faith in electoral contestation to gain public office and gives legitimacy to political parties as primary instruments for acquisition and transfer of power from one set of individuals to another. Limited utility for promoting democratic norms and performing legislative/rule making functions in the parliament. Despite making struggle for the restoration of democracy, the political leaders, elites and interest groups, have failed to build a legal framework, create a pro-democracy environment, and most importantly, develop a policy framework in which conflicts may be resolved inside the parliament. A lack of consensus on how the country has to be governed has plagued Pakistan’s history with cyclical patterns of military rule and weak civilian governments. Khan and Qadri have set an extremely dangerous precedent in Pakistan. If they succeed in bringing down the government, the locus of political contestation in Pakistan will shift to the streets, rather than in the parliament. This process of succession through sit-ins is also dangerous because it cements the Pakistani military’s role as the ultimate arbitrator in all such situations. As we have already seen, the military is now formally arbitrating between the politicos to end the impasse. To be sure, by asking the military to do so, the government has only brought out in the open what has been true all along: that the military could have blown the whistle on the crisis at a time of its choosing, forcing either the protestors or the government to call it a day. The Pakistan democracy is far away to establish its principles and beauties. The politicians are responsible for military involvement in politics, sharing spaces with general and coup or soft coup from the cantonment. Gaza Peace Deal Why Now?